Karbon Insights helps you keep a finger on the pulse of everything going on throughout your company. Easy-to-read reports provide you with statistics and charts about your company's output, including client and colleague leaderboards. 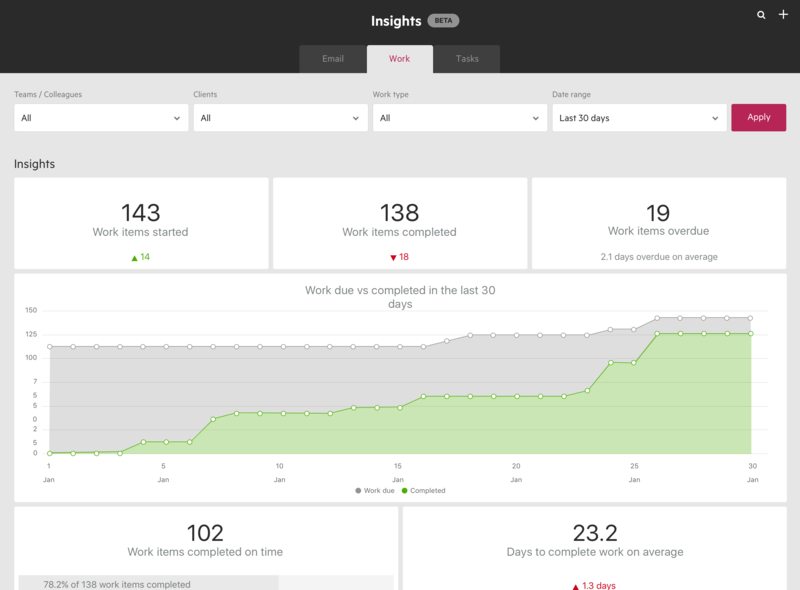 Work Insights, located off your main menu, allows you to see a top-level view of all of the work in your company. Various charts and leaderboards provide you with critical information. Insights includes charts and graphs that detail data pulled from your Karbon account. Some charts allow you to select what time period you want to see. You can hover your cursor over areas of the charts for more details information. If you are unsure about what a certain chart or statistic is showing you, you can hover your cursor over the "?" icon.